In 2015 I took a new direction and advertised for crew to join the boat during a two month cruise. The very loose itinerary was to take two weeks to sail to the Whitsundays, spend 4 weeks there and then take two weeks to get back. We left mid July, got to Hamilton Island by the end of July, watched the races at Airlie Beach and Hamilton Island Race weeks, and then took a leisurely cruise home, arriving mid September. Taking people I had never met was always a gamble but we had a ball. People joined and left the boat at different times. We kept the costs to $50 per day including food, marina berths and fuel, we saw whales,dolphins, turtles, manta rays. 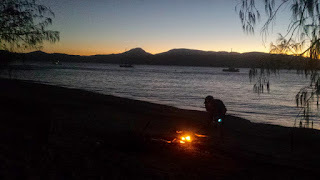 We caught and ate fish, anchored in some beautiful bays, had camp fires on the beach. We ate out rarely, enjoyed great nights at anchor, even played guitars. Thank you Simon, Gabriel, Ryan and Natasha, Grant and Fran, Joost and Karin, Shane and Darrell for your company. Places where crew can join or leave the boat are Cairns, Townsville, and Airlie Beach. You can join at Magnetic Island too, get to Townsville and catch the ferry across. While the boat is in the Whitsundays it is a simple matter to drop or collect people from Airlie or drop them at Hamilton Island at dates other than those above. Costs will be about the same as 2015, except during Race Week when they will increase to $80 a day to cover race fees, insurance etc. Minimum duration to be on the boat is a week. Any less and you won't get the experience. Getting people on and off the boat usually takes up a day. As I say, this timetable is very fluid at this point. If you are interested in joining the boat at all, register your interest and we can work up a plan once I know who is on board.